Within the Index’s Employment theme, two measures are key to understanding human capital under-investment and under-utilization through lost employment opportunities across the age group spectrum of the global population: the economically inactive part of the population and the unemployed population. The economically inactive population includes those not looking to join the labour force for the time being—including individuals who are not of a working age, students enrolled in full-time education, the elderly, primary caregivers in families who take on this responsibility full-time, as well as those who are unable to work due to ill health and those who have abandoned their attempts to find work in the labour market out of an expectation that they won’t find any. The economically active population includes those in any kind of work: part-time or full-time, short-term or long-term, as well as individuals actively looking for work—the unemployed. Despite some internationally coordinated efforts at better measurement, the informal labour market, care work, short-term work and own-account work remain inadequately reflected in conventional labour statistics. Along the world population’s globally aggregated life-cycle, a series of peaks and troughs can be observed. Among those under age 25, we see high levels of economic inactivity, mostly relating to study and transition-to-work patterns. The expectation that young people should work between the ages of 18 and 24 varies by economy, and this is reflected in the Index’s data. We observe some of the highest unemployment rates globally among young adults in countries such as Serbia (57), South Africa (88), Spain (45) and Tunisia (101). Only 38 economies in the Index have youth unemployment rates in the single-digits, with Qatar (66) and Japan (4) particularly notable in this regard. On the other end of the age group spectrum, after the age of 54 we observe a sharp rise in the global economically inactive population—with notable exceptions, for example, in Iceland (20) and Switzerland (3). Most countries see a more dramatic drop of economic activity after the age of 65, corresponding to the legal retirement age in many economies. Nevertheless, about a quarter of the world’s population age 65 and over remains active in the labour force. In predominantly lower-income economies, such as Malawi (114), older people often work past their country’s healthy life expectancy out of economic necessity. By contrast, in higher-income economies such as New Zealand (6), a significant share of older workers remains economically active, corresponding to higher life expectancies, enabling their country to leverage the human capital potential of an experienced ‘silver’ workforce. Among a cluster of countries—principally in the Middle East and North Africa but also, for example, in Korea, Rep. (32)—low workforce participation during the prime working age of 25–54 is related to women’s low participation in the labour market. Across all age groups, a particular case is presented by those considering themselves underemployed–people who would be willing and available to work additional hours but who have failed to obtain such work under prevailing labour market conditions. This ranges from one in three young people age 15-24 in countries such as Ethiopia (119), Indonesia (72) and Paraguay (82) to about 10% of the total older workforce in many European countries. Full-time work for a single employer is one of a number of avenues through which people earn their livelihood and develop their human capital potential. It is, however, far from the only form of employment. Some people form companies and become employers themselves. Others take part in freelance or limited-time contract work across a wide range of sectors. Especially in the developing world, many people contribute to a family business, often in agriculture. On average, based on the available data from the Human Capital Index, we estimate that, globally, around 53% of the working age population are employees of some kind—whether working formally for others, working for others without a formal contract in the informal economy or contributing to a family business.30Another 13% are self-employed, own-account workers, 4% are unemployed and 20% are inactive—having dropped out of, or never entered, the labour market (Figure 15). Regular employment is highest in countries such as Sweden, Iceland, Switzerland and Germany. More than a quarter of all workers in Bhutan (91), Vietnam (68) and Colombia (64) are own-account workers. In addition, 30% of workers in Ethiopia (119) and 22% in Indonesia (72) are underemployed while in countries such as Morocco (98), Turkey (73), Egypt (86) and South Africa (88) around a third of the population is economically inactive. Advances in technology are leading to a reformulation of the global work landscape. As revealed in the World Economic Forum’s recent Future of Jobs Report, digital disruptions, together with demographic and socio-economic drivers of change are transforming traditional employment. Some disruptions to industries will necessitate a shift in employees’ skillsets, while others will lead to wholly new jobs or make particular roles redundant. A number of these disruptions are impacting the nature of what it means to be an employee, as work begins to be outsourced in new formats. The Future of Jobs Survey data revealed that global business leaders perceive changing work environments and flexible working arrangements to be a key disruption—on average, ahead of drivers of change such as machine learning and automation—and as one that is already felt across countries and industries (Figure 16). Own-account workers, in their reformulated role within the disrupted labour market, have been re-imagined as the “contingent workforce”, “on-demand workforce”, “online platform economy”, “alternative work arrangements” and “gig economy”. The ways in which workers engage with those formats vary from moonlighting to full-time freelance work, as well as, in some cases, building a business. Some workers enter these new digital landscapes by choice, others more by necessity—seeking to supplement their income. Moreover, a growing number of participants in these roles are those previously outside the labour force due to not being able to find work suiting their circumstances. Both the real and perceived blurring of boundaries between traditional and own-account work as well as the growth of own-account work through digital platforms has given rise to many uncertainties in modern labour markets—and many new opportunities, if managed well. Using both public and private data from a selection of digital talent platforms, we aim to shed light on some of these unknowns and identify potential opportunities. First, although digital formats for connecting people to work are relatively new, the act of ad-hoc work or self-employment is not. With a global average of 13% own-account workers, the world working-age population is already deeply engaged in analogue formats of on-demand work. As Figure 15 highlights for economies where this data is available, these figures vary significantly by economy. Workers enter into formal agreements either directly or through traditional talent platforms, including staffing firms, to provide their skills and services and this is still the majority of own-account work in most countries. Emerging digital platforms have begun to provide potential workers with easy access to an online marketplace—in effect, a newly digitized labour market. 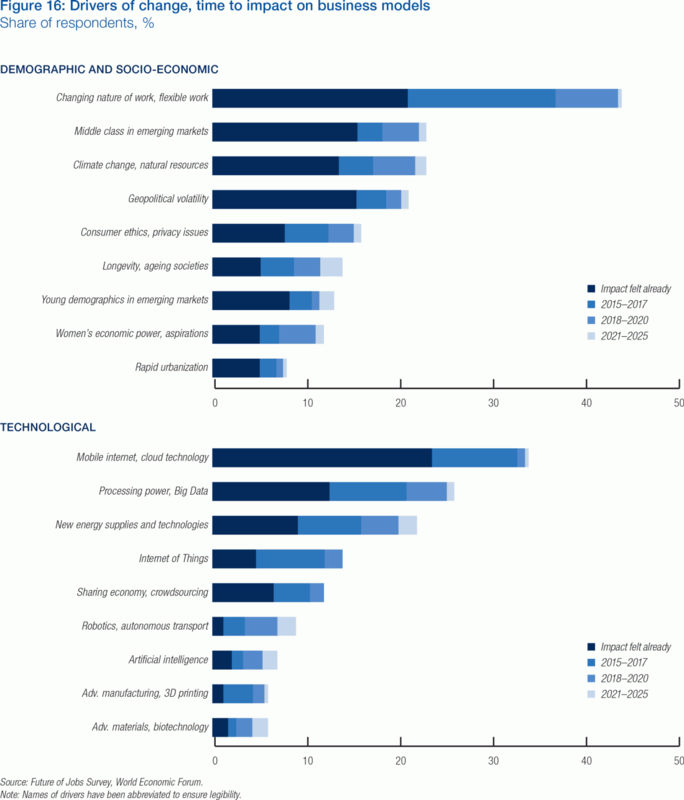 This type of work can range from being based on long-term relationships to short-term gigs and can fall under various regulatory classifications.31 Economic Graph data analysed by LinkedIn for this Report indicates that in each country, between 1.8% to 2.6% of members identify themselves as being part of the analogue or digital on-demand economy (Figure 17). 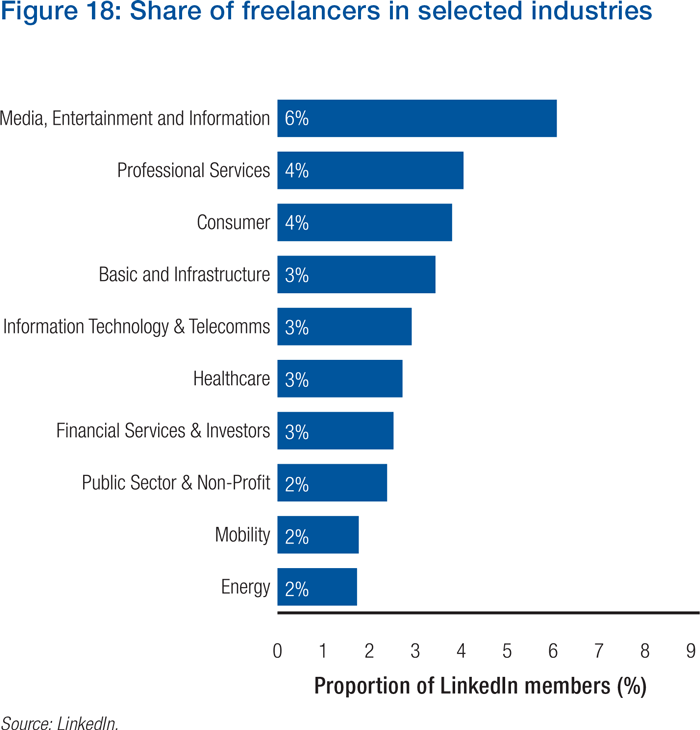 Searching the public information listed on members’ profiles for various keywords to identify gig-economy workers, LinkedIn also analysed the on-demand economy at an industry level. 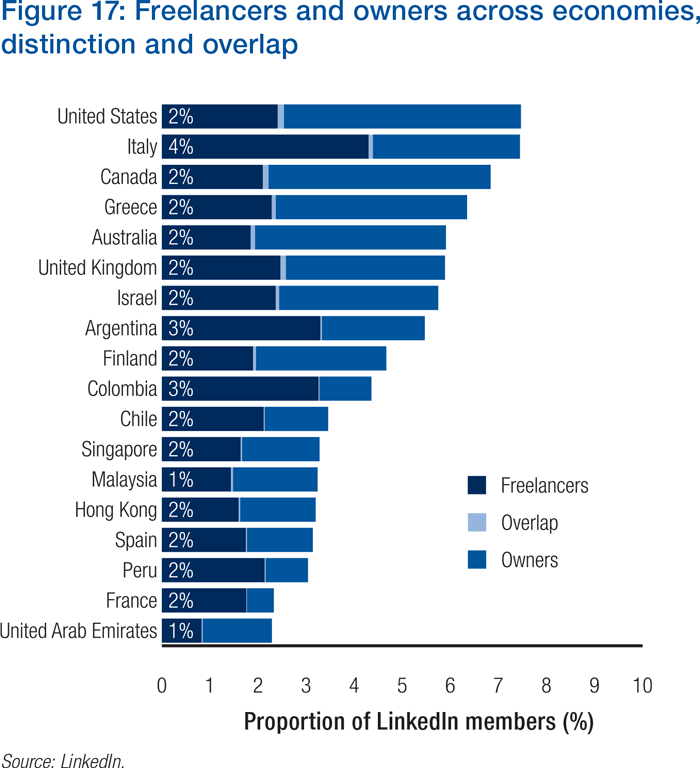 As illustrated in Figure 18, as seen through the prism of LinkedIn’s membership, the freelancer economy is most prevalent in the Media, Entertainment and Information industry, at 6%, specifically in writing and editing (21%) and graphic design (14%). Second, own-account work is growing, including own-account work enabled by digital platforms, but digital formats remain a small portion of own-account work. Some of the fastest growing new opportunities for work in countries such as the United States (24) are on such platforms.3232 Recent research by Harvard economist Lawrence Katz and Princeton’s Alan B. Krueger finds that “all … net employment growth in the U.S. economy from 2005 to 2015 [9.4 million jobs] appears to have occurred in alternative work arrangements.”33However, these arrangements for the most part did not involve work arranged through online gig-economy platforms, which Katz and Krueger estimate to actually only account for 0.5% of the U.S. labour force in 2015. Similarly, De Groen and Maselli34 estimate that, as of 2015, digital talent platforms accounted for a small fraction of total employment across the European Union. However, both sets of researchers acknowledge that the gig workforce is growing rapidly, with some estimates suggesting that 40% of U.S. workers—about 60 million people—might be accessing work opportunities through digital talent platforms by the year 2020. According to the U.S. Congressional Research Service, “to date, no large-scale official data have been collected; and there remains considerable uncertainty about how to best measure this segment of the labour force.”35LinkedIn’s data was able to shed some light on whether online gig-economy workers represent a new form of work or a continuation and digitization of existing analogue forms of own-account work. LinkedIn specifically analysed the overlap between members who identify themselves primarily as gig-economy workers and those who call themselves “owners” or “entrepreneurs.” As can be seen in Figure 17, Figure 17, within the LinkedIn membership, there is little overlap between the two, providing further support for the hypothesis that growth in the online gig economy is thus far primarily the result of connecting those who were previously own-account workers. Third, digital platforms are prevalent in both the developed, emerging and developing world, where the number of own-account and informal workers are traditionally higher. In China (71), Didi Chuxing,36the country’s largest on-demand transportation platform, is currently utilized by some 13.3 million registered drivers (as of April 2016, a 600% year-on-year growth rate), accounting for 4.2% of service sector employment in China. Of these, 1.86 million drivers (14%) are women, and also include other demographic groups such as formerly laid-off workers and small business owners. Seventy-five percent of drivers use the platform part-time, driving less than four hours per day, while 78.1% reported a more than 10% income increase—and 39.5% a more than 30% income increase—from using the platform. Countries such as the Philippines (49) and Kenya (102) have staked large parts of their human capital development strategies on digital business process outsourcing (BPO). Companies such as Sama37 have successfully pioneered business models linking low-income populations in parts of Africa and South Asia to digital work. Fourth, digital work platforms can span a range of both high-skilled, high-paid work and low-skilled, low-paid work as well as varied durations of tasks and relationships associated with them. The selection of platforms highlighted below represent a very wide-range of skills between them. Less evident but equally illuminating is the range of skills and pay rates within some of these platforms. 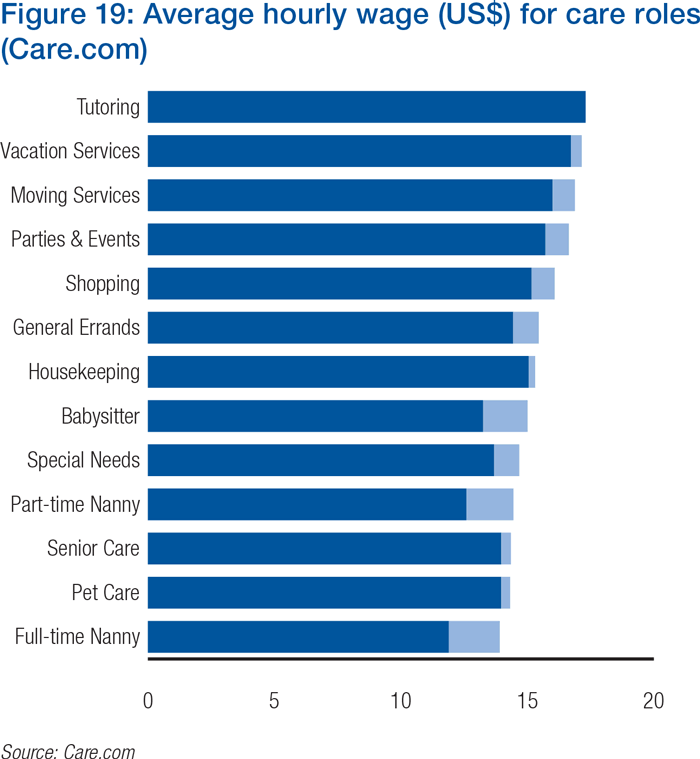 For example, Care.com data shows not only the rates for what was in the past often informal labour—pet care, babysitting, etc. 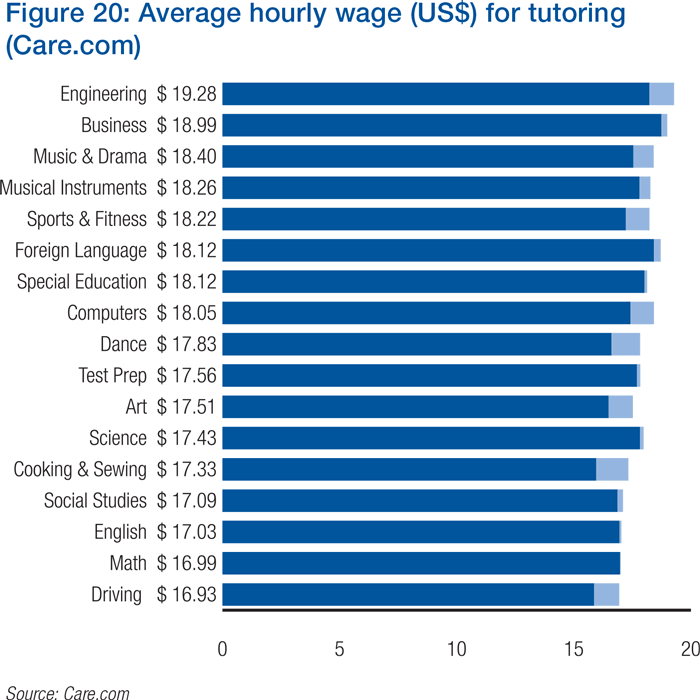 (Figure 19)—but also reveals the pay premium placed on work such as tutoring over traditional care roles (Figure 20). Online labour markets, crowdsourcing and e-lancing platforms are also creating fluidity in organizational boundaries. Though in the beginning they mostly involved data entry and unskilled work, such platforms now increasingly involve advanced highly-developed specialist skills as well (Table 7). Finally, online labour markets—cross-sectoral talent platforms such as LinkedIn, Njorku or Dajie and and industry-focused talent platforms such as Care.com, Didi, Uber and Upwork—are all shedding new light on information that is either wholly or partly missing from most international and national statistics. For example, the online gig economy provides some transparency on the work of those that were engaged formerly in weakly formalized contingent and own-account work labour markets, such as those in the care economy. Additionally, in the earlier section on learning we outline some of the findings on skills that are currently blind spots in international statistics. To the extent that digital talent platforms make large segments of the labour market more easily visible and measurable, often for the first time, there is unprecedented opportunity for smart regulation. 30 Also refer to ILO, 2015; and Rizzo, et al., 2015. 31 See Capelli, et al., 2013. 32 See Katz and Krueger, 2016; Manyika et al., 2015; Upwork and Freelancers Union, 2015. 33 See Katz and Krueger, 2016. 34 See De Groen and Maselli, 2016. 35 See Congressional Research Service, 2016.